What happens to the molecules of something when it is heated? They ____when heated and ____when cooled. Name an exception to the principle that substances contract when cooled. Water ________ when it __________. How are heat and temperature different? How are heat and temperature measured? Name some materials that are good conductors. What are some good insulators? Fiberglass is a good insulator because________________. 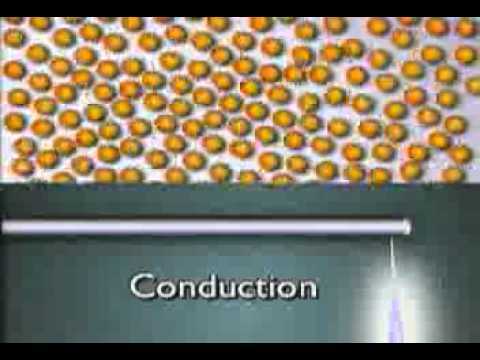 Why are liquids and gases not good conductors? How is heat transferred in liquids and gases? How is heat transferred through empty space? Good job finish watching the video! Please remember to answer all 15 questions in your notebook. Use this as a note to study for your Heat Transfer Quiz next week!